I started shaving my legs at the beginning of middle school, like many of my 11- and 12-year-old friends at the time. I wasn’t an overly hairy person then (or even now), but I grew up playing sports in South Florida and attended college in North Florida. As a result, I was used to wearing shorts at least 340 days of the year. Besides sunscreen, when you’re dealing with 90-degree temperatures, shaving is one of those non-negotiables for many. I’m not going to break this down into a math equation, but just know: I spent nearly every other day — for an entire decade — gliding a razor over my limbs to avoid hair and stubble. Post-graduation, when I moved to New York City, and entered the workforce, I decided that shaving was taking up too much time in the shower. Even if I could conceal my legs during frigid Northeastern winters, I wanted to be bare. Waxing and growing out my hair didn’t appeal to me, so I had two options: become unkempt, or get laser hair removal. I chose the latter, and it changed my life. If you haven’t experienced laser hair removal, but are eager to start the process, this is what you need to know before, during, and after your first session. And of course, talk to your doctor before treatment. 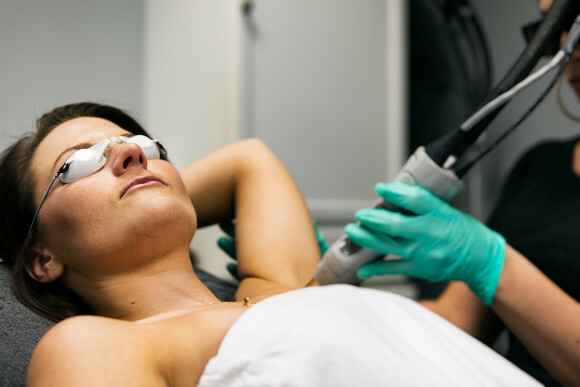 Like any medical treatment, there are possible risks and side effects, so work with a professional to determine if laser hair removal is right for your skin. Hair Color Matters — Skintone Is Less Important. Whether you’re treating your face or toes (and everywhere in between), the hair can only be eliminated if it has pigment. “An ideal candidate is someone who has dark hair to remove,” says Christian Karavolas, owner of Romeo & Juliette Laser Hair Removal. “Candidates who have white, light blonde or light red hair are not candidates, as laser is attracted to pigment.” However, new technology is being developed all the time, so remain hopeful! Lasers that work for you could be available soon. Laser Hair Removal Is Gender Neutral. Though women are more prone to booking this appointment, men are also fans of laser hair removal. However, each gender prefers to treat different areas. According to Karavolas, women most commonly opt to laser their legs, bikini, underarms and face. For men, it’s usually chest, back, arms, buttocks and bikini. More and more men are also choosing to laser their necks in the name of reducing ingrown hairs from shaving. Learn more about this here. Rather than buying shaving cream, razors and other drugstore products — or waxing packages at your local spa — purchasing laser hair removal treatments can benefit your wallet. “In the short term, the price tag may be higher than any other modality,” notes Karavolas. For example, at Romeo & Juliette Laser Hair Removal™, an upper lip session costs $75, while full legs are $700 per session. “However, in the long term, results are more permanent,” she says. Spending that money up front means never devoting chunks of your paycheck to a leg wax again. Do Your Laser Research (via Search Engine Counts). It’s important to find a reputable, experienced place for laser hair removal — after all, this is technically a medical treatment! — and know ahead of time which lasers are most suitable for your skin. Most spas, laser centers and doctors’ offices will list their lasers online (and if they don’t, you can always call and ask what technology they use). If a laser designed for dark skin is selected for a client light colored skin, there won’t be much hair loss. And more severe problems can occur. “If the wrong laser or settings are used, one can see some first degree burns, that usually heal within two to three weeks,” says Karavolas. Again, it’s important to do your research. Benefits: Best for people with dark hair and light skin, it’s excellent for long-term hair. removal. This is largely comfortable to experience (compared to other lasers), often results in finer and sparser hair growth, and there’s a cooling built into the laser to minimize chance of burns. Disadvantages: This technology is a bit older and cannot be used on tan or dark skin and cannot be used on white or light hair. Because it’s best for treating smaller areas, it may take more time per treatment to see results. There’s also a risk of redness and swelling. Benefits: It works on a fairly wide range of skintones and hair colors (but especially light complexions) and is effective on both coarse and thin/fine hairs. It’s one of the fastest lasers available, and can easily treat large areas on the body. Disadvantages: There’s a possibility that this laser could either darken or lighten the area that’s being treated, and it’s not effective on deep skintones. Treatments with this laser could also be more uncomfortable than others. Benefits: This is an ideal option for nearly every skin type, including tan and deep complexions. It can rapidly treat larger areas of the body, too. Disadvantages: It isn’t successful on white, light, or fine hairs, and may cause more discomfort than some of these other options. It could even cause swelling and scars if the technician isn’t experienced. Benefits: It works on complexions from light to deep (but is best for light to medium) and can treat large areas of the body. It’s especially effective on thick, coarse hairs. Disadvantages: You could be at risk for burns, skin discoloration, redness and swelling, as well as urticaria (itchy hives). That said, shaving is completely acceptable — and even encouraged, especially a day or two before the treatment. You want the hairs to be short so the laser focuses on treating the follicle below the skin’s surface, not the hair above it. Clean, Healthy Skin Is Happy Skin. For that same reason, it’s also important to avoid the sun two weeks before laser hair removal. Additionally, you should be cautious if you’re taking any medications. All antibiotics should be out of your system for at least a week before you’re treated. Consult with your laser technician or dermatologist if you have further questions. Block Some Time on Your Calendar. Like shaving, the time commitment needed to reduce hair is contingent on the amount of space you’re targeting. Sessions can last anywhere from five to 40 minutes, depending on the area of the body. For example, your underarms require a shorter session than full legs. Talk to Your Doctor Beforehand. It’s always a good idea to discuss any medical aesthetics treatments you’re considering with your doctor to avoid any unexpected snafus. It’s an especially smart move if you get cold sores. While lasers can’t give them, they can trigger the not-so-attractive bumps if you already get them. Expect a Bit of Discomfort. During the actual process, you should anticipate a slight zap as the laser gets to work. To most, it feels like the minimal snapping of a rubber band. That snap is followed by a cooling sensation, either via cold air or spritzes of water. What’s actually happening here? Karavolas explains, “Laser is a monochromatic beam of light that bypasses the epidermis and disables the reproductive cycle of the hair within the follicle.” Translation: the laser is going to damage the hair follicle using light without causing injury to the skin. After each session, you can expect some mild erythema (read: redness), according to Karavolas. But it certainly isn’t permanent, or even long lasting — it should dissipate within 20 minutes to a few hours. If you’re received treatment on your face, though, you might want the redness to resolve itself a little sooner. Ask the person who administered your treatment if they have any cortisone cream on hand. A little dab could help soothe and relieve it! You’ll want to book your next appointment on the way out. Full reduction usually takes six to eight sessions, spaced anywhere from five to eight weeks apart, depending on your hair’s regrowth cycle and how your hairs are reacting to the laser. (Your laser technician can advise.) Booking that early will help you keep your treatment on track. And don’t even think about lying out in the sun! Your skin could be overly sensitive after your laser treatment, and as a result, could be at risk for an adverse reaction like hyperpigmentation or burns. “Post treatment, apply sunscreen and do not go tanning until the redness goes away,” adds Karavolas. If avoiding sun exposure is too much of a dealbreaker, consider scheduling your treatments during winter months. There’s an added bonus to starting in winter: by the time you complete your sessions, summer will be on the horizon — just when you’ll want to show off your bare skin.